Block 1: Fundamental skills, Ballistics, and live fire at 100-200meters. Block 2: Ballistic software, sniper equipment, engagement techniques, known distance shooting, and equipment practical application. Block 3: Sniper Tactics and employment, foreign weapons, ballistic testing, Glass shooting, Unknown distance shooting (day and night) with 5.56LR, 7.62LR, .300WM, and .50 Caliber rifles, and moving target shooting. Block 4: Qualification on the MASC qualification course, a composite score based off of four separate and timed drills including barricade shooting, day and night unknown distance, and spotter qualification. Block 5: Aerial sniping, Explosive loophole breaching, Loophole shooting, Side prone shooting, High angle shooting, Urban hides, Vehicle hides, Surveillance equipment practical application, and the culminating exercise; a four day reactive scenario in which sniper teams locate targets, conduct surveillance, and eliminate targets as part of a Marine Special Operations Team, utilizing the full spectrum of SOF assets and equipment. An ISAF Special Operations Team member ( MARSOC ) assists with security while Afghan Local Police receive their first payments in Helmand province, Afghanistan, April 9. Afghan Local Police complement counterinsurgency efforts by assisting and supporting rural areas with limited Afghan National Security Forces presence. 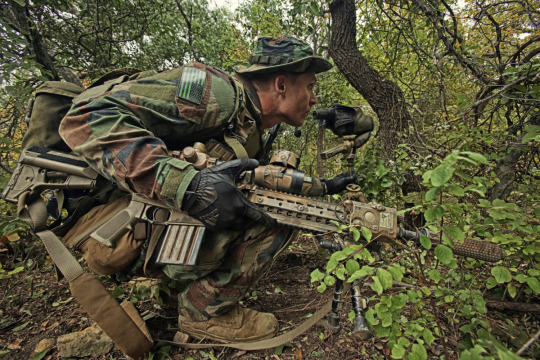 MARSOC training during a visit, board, search and seizure exercise.